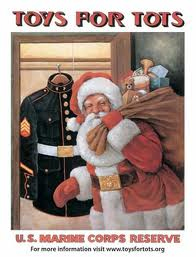 Remember Toys for Tots This Christmas! Please Remember Toys for Tots! While many people are having difficult times these years, please remember that many children would receive no gifts at all except for the US Marine Corps’ Toys for Tot program. Over recent year, many Toys for Tots units (each are run locally) not accept toys for children of all ages, they accept items such as winter hats, gloves and mittens, and other warm garments. When my husband and I go shopping each year, we each pick out an item we would like to get if we were kids and donate it to Toys for Tots. We hope you consider doing the same. Example of Really Sleazy Shipping Price Ploy! We have written many articles about why it is important to pay attention to shipping costs when comparing prices online, but this one actually really set us off! Technically, the listing is legitimate. Well, kinda sort of…it all depends on the definition of what “IS” is. And at holiday time, when many shoppers are looking for the best deals, these type of things happen more often than usual. Actually, this pricing/shipping ploy it is quite misleading and frankly outright deceitful. The merchant is either really unintelligent, or was intentionally playing games to show as the merchant with the “lowest price” for this item. Well, we know for a fact that this product’s manufacturer has a MAP (Minimum Asking price/Minimum Advertising Price) for all of their products. For the record, the MAP for item shown is $199.99 for most small resellers. Go Green this Holiday Season with Solar Gifts! Go Green with this Holiday Season with Great Solar Gifts! Silver, gold, red and green are traditional colors for the winter holidays. This year, why not Go Green with a solar gift? There are a lot of solar items to choose from these days, from the strictly practical to the purely fun. From solar toys to flashlights and battery chargers, you can put a smile on even the most “hard to shop for” people this year. Not only are there more solar items to choose from than in the past, the quality of many items has dramatically increased as solar technology continues to improve. Remember that with solar products, you often get what you pay for. If you see two products that seem virtually identical expect for a large price difference, look closer at the product description. It’s said that the “Devil’s in the Details,” and the more costly product most likely uses superior solar technology, meaning your gift will probably work better and last longer if you choose the higher price options. November 11 is Veterans Day, Our Best Wishes to Vets of All Ages! Honoring All Who Served. Thank a Vet Today! SolarLightingSmart.com supports our Troops and our Veterans! 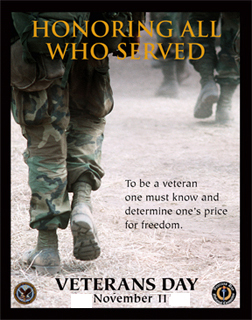 Veterans day is November 11 (every year). This weekend, make sure to thank a Vet or service man or woman! 2011 Holiday Shopping Season Is On: Support Small Online Retailers! The 2011 Holiday/Christmas season has officially begun, with Walmart kicking it off Saturday, November 5, 2011. So, Happy Holidays or Merry Christmas! We mean no offense to other religions or those with no religion at all, but Christmas IS the number one source that drives sales in November and December. This year, the Saturday After Thanksgiving is Small Business Saturday, where Chambers of Commerce across the US will ask consumers to support small local Brick and Mortar Stores. We think this is a great idea, but hope to carry the theme over to small online retailers. It’s pretty much known that when any huge national retailer (and we single out nobody in particular) moves into an area, some jobs are created. Unfortunately, many small retailers soon go under, causing other jobs losses. And once small businesses are driven out, the low prices at many “Big Box” stores often start creeping up. Often (but by no means always or even usually), large national stores can offer lower prices than small e-commerce sites. Usually the savings are small, but in these times most people are saving where ever they can. When considering the “best deal,” do you think about the many advantages shoppers get when they buy from small retailers. You can’t really put a dollar value on these things. Here are some things to think about this year when you compare prices when shopping for holiday gifts, and our pitch on why to support small businesses in general and small online retailers in particular! The following article is from one of our favorite renewable energy news sites: Renewable Energy World.com, which is a very pragmatic, business-oriented site. It notes that 9 of 10 Americans want more solar power. Many subsidies and tax incentives outlined by President Bush in the 2008 Stimulus Package have been trimmed severely by the current US Congress, while subsidies to large oil companies remain intact. Your job: let your state reps and Governor know that you vote and that you are in favor of solar energy. And, also notify your US Congressperson and Senators. The bottom line is that your opinion does matter if you choose to let it be known. Politicians know that for every email, phone call or letter they receive, several people feel the same way but don’t bother to contact them. By voicing your concerns, they are more likely to realize that Your Vote and You Want More Solar. So, read the following article and then make a phone call, or send out a quick email or letter.